In 1963, the Yale Uni­ver­si­ty psy­chol­o­gist Stan­ley Mil­gram pub­lished the results of a study he did to mea­sure the will­ing­ness of par­tic­i­pants to obey an author­i­ty fig­ure and per­form actions that con­flict­ed with their con­science. Par­tic­i­pants were led to believe that they were tak­ing the role of Teacher in a learn­ing exper­i­ment. Actors took the roles of Exper­i­menter and Learn­er. The Exper­i­menter instruct­ed the Teacher to ask the Learn­er ques­tions, and if the answers were incor­rect, press a but­ton to admin­is­ter an elec­tric shock to the Learn­er. The Learn­er, an actor, inten­tion­al­ly answered ques­tions incor­rect­ly, and respond­ed as if to a real shock. As the exper­i­ment pro­gressed, the Exper­i­menter asked the Teacher to increase the lev­el of shocks, even though the reac­tions of the Learn­er sug­gest­ed that he was in great dis­tress. In the first set of exper­i­ments, 65% of the par­tic­i­pants admin­is­tered the high­est lev­el of shock, which they were told was 450 volts. Oth­ers have repeat­ed the exper­i­ment in the years since; I was remind­ed of it by read­ing about a recent rep­e­ti­tion in Poland. And I thought of the ear­ly edu­ca­tion of many rid­ers. “Kick, kick, kick!” The stac­ca­to music of a les­son barn. There are rea­sons to kick a horse. There are many more rea­sons not to. Most kicks admin­is­tered by rid­ers to hors­es are giv­en out of frus­tra­tion, and almost always before oth­er meth­ods of com­mu­ni­ca­tion have been exhaust­ed. For­tu­nate­ly the kicks of an eight‐​year‐​old don’t do much dam­age to a horse, and most les­son hors­es have expe­ri­enced worse. Unfor­tu­nate­ly, the stu­dent is nev­er taught how to rec­og­nize when a kick is nec­es­sary, but rather that it’s always nec­es­sary when a horse isn’t “obey­ing”. And the expec­ta­tion has been cre­at­ed. Force is always an option. Pain com­pli­ance is nev­er­the­less com­pli­ance. And by the time that eight‐​year‐​old becomes an adult, with spurs, or a crop, or a twisted‐​wire snaf­fle, or draw reins, “Kick, kick, kick!” has been inter­nal­ized. When oth­er “author­i­ty fig­ures” chime in with “Show him who’s boss,” “Hors­es don’t feel pain the way we do,” “Make him yield at the poll,” the mes­sage is rein­forced. We’re teach­ing the hors­es, so it must be okay. Where do we go to find the evil here? We all came through the same sys­tem. We learned the same lessons. Some of us real­ized what we were doing and said, “No! I won’t do this any more.” Oth­ers con­tin­ue to go along, because of igno­rance, social pres­sure, or expe­di­ence. Kick him. Push the but­ton. You have no oth­er choice, you must go on. Chaps, or cha­pare­jos, are cov­er­ings for the legs, orig­i­nal­ly intend­ed to pro­tect rid­ers going through thick­ets of shrubs. But shrubs come in all heights, even here in south­ern Cal­i­for­nia in the land of chap­ar­ral, and a hel­met pro­tects you from the high­er ones. 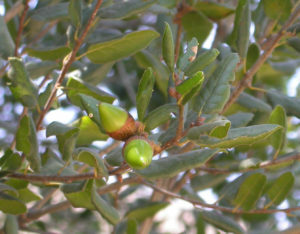 This is coast live oak, a tree with stiff branch­es and leath­ery, spiny leaves. Hors­es gen­er­al­ly know how tall they are, but don’t have a good sense of how much high­er you are when you’re in the sad­dle, and so you learn to duck. And it’s nice to know that your hel­met pro­tects you from all the stray branch­es. Sure, you could wear a cow­boy hat—oh, and use the chin­strap to make sure it’s not ripped off your head (it does have a chin­strap, right? )—but hats cost about the same as hel­mets, they don’t pro­tect your head as well, and they tend to get ripped up a lot faster. There are plen­ty of rid­ers and train­ers who demand blind obe­di­ence from hors­es. (For the hors­es’ sake, it would prob­a­bly be bet­ter if these folks didn’t wear hel­mets.) For the rest of us, an impor­tant part of our rela­tion­ship with hors­es is trust, and peo­ple will tell you that they don’t wear a hel­met because they trust their horse. A friend once wrote of her horse, “My life is in his hands.” That’s cer­tain­ly true, and most peo­ple who work with hors­es under­stand this. But I respond­ed, “It is also cor­rect to say that his life is in your hands.” We all know many ways our hors­es could kill us. But it turns out that our hors­es have mis­con­cep­tions about how we could kill them. What will hap­pen to your horse if you are killed or severe­ly impaired by a trau­mat­ic brain injury? Yes, there are sport hors­es that could be eas­i­ly sold and con­tin­ue their careers with new own­ers. There are own­ers whose fam­i­lies have the resources to take care of a horse when the own­er is unable to. But the major­i­ty of hors­es are one sale away from the kill buy­er. It doesn’t mat­ter that we don’t play the preda­tor and kill and eat them. The com­mon­est way we kill our hors­es is by not being there when they need us. The major­i­ty of hors­es are one sale away from the kill buy­er. When I ride Bud­dy, I know that he goes out of his way to avoid killing me, and there are times when he has believed him­self to be in great dan­ger that he clear­ly want­ed to take me to safe­ty with him. I trust him. But I know that he can make bad deci­sions. Bud­dy doesn’t expect me to kill him (even when I squirt med­i­cine into his eye). He trusts me. He may not real­ize that I, too, can make bad deci­sions, but I know it. When I wear a hel­met, I am acknowl­edg­ing that he can make bad deci­sions. When I don’t wear a hel­met, I am mak­ing a bad deci­sion, a deci­sion that in the worst case will result in his death. I owe him more than that.